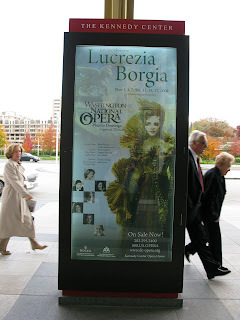 The whole point of going to Washington, DC last weekend was to see Renee Fleming in Lucrezia Borgia. She was only doing four performances and this was her debut at the Washington National Opera. Lucrezia Borgia had not been performed in New York not since 1965 when Monserrat Caballe did a concert version at Carnegie Hall. We knew there was no way we could miss it. Very early, Wanda with her Patron and Subscriber status at the WNO, hooked us up with tickets (along with half of the rest of the world) and we booked our $11 roundtrip tickets on the MegaBus. Everything else that happened was just a bonus. We arrived early in the District on Saturday and Wanda picked us up. We met up with Chelsea for lunch and then we all went to the Capitol for a personal tour directed by Chelsea. She's works for a Congressman from AZ and is a fabulous young lady. It was off the hook! 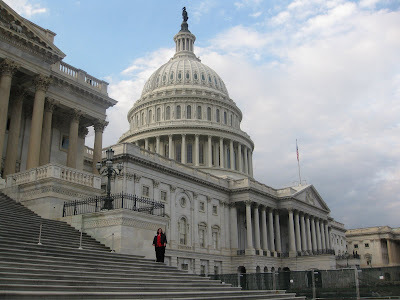 She took us all over and around the Capitol building, even behind velvet ropes. She filled us in on lore, rumors and facts beyond my wildest dreams. Making the tour extra cool was the fact that Wanda also worked in and around the Capitol for a number of years so she shared a number of stories as well. After the fabulous day, we touched down at Wanda's in Arlington - the HQ of the Hostess with the Mostess. She treated Sally, Chelsea and me with the finest h'ors d' oevres and tasty adult beverages. Eventually, Cordellia joined in on the fun and the laughter went on for hours. On Sunday morning, Maggie joined us for brunch at Clyde's in Alexandria. Then finally, it was time for the trek to the Kennedy Center. Khaleem met us there. He bought the ticket that Wanda bought for Noah who sold it to Kari who in turn couldn't go. Thank goodness, we kept that ticket in the family. We had fabulous first tier seats. Lucrezia Borgia was fantastic! It's always exciting to see La Diva Renee in a production of anything, but this was a great opera! It's Donizetti and it's bel canto, which I haven't really loved, but this one was beyond fab. It's based on the true story of the Borgias, which I love. The costumes were gorgeous and the whole thing was campy and over the top. We couldn't have asked for anything more. My favorite part was at the end of Act I when Renee as Lucrezia walked back up stage and the name BORGIA on a sign dropped down from the ceiling and she reached up for it. It was so Mama Rose after the Turn! I couldn't help but laugh out loud with delight! Renee said that it was the absolute limit of difficulty for her but she nailed it, especially dramatically. And boy could she wear those costumes - in her words, "Barbarella armour and thigh high boots." After the performance, there was a Talk Back by most of the cast as well as Maestro Domingo, who also conducted the performance. Renee said that Peter Gelb of the Met was going on Tuesday night so perhaps he liked the production as much as we did and will bring it to New York. We can hope! We were treated to a trip backstage as well, where we visited with La Diva about the production and some other projects. She never ceases to amaze me. She seemed completely energized and happy. She also sprayed each of our wrists with her new perfume, La Voce. It's sweet but not overpowering and I'm pretty sure my voice instantly improved. Afterward, a huge group of us - from England, France, NY, MA, NJ, VA, and FL, headed to Bar 600 which is in the last Watergate building, to celebrate. The bar probably never smelled so good with the likes of us. La Diva Renee happened to be there as well and bid us adieu after she finished her meal. One of the best benefits of following La Diva is the opportunity to meet like-minded individuals from all over the world. 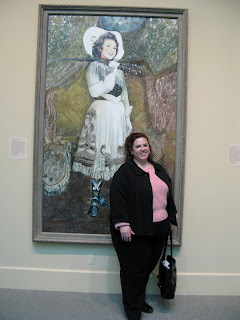 On Monday, due to a lazy and side tracked start we abandoned plans for a trip to Mount Vernon in favor of stops at the Titanic Memorial and the National Portrait Gallery. I had been longing to see both of these so I was definitely okay with the change in plans. Mount Vernon, home of my favorite President, will just have to happen next time. Oh, lovely! I've been waiting and waiting for a full report. I'm glad you all had such a lovely time. Next time WE will go to Mount Vernon. Yay! You found the painting of the Merm!!! Steve, that one was for you!